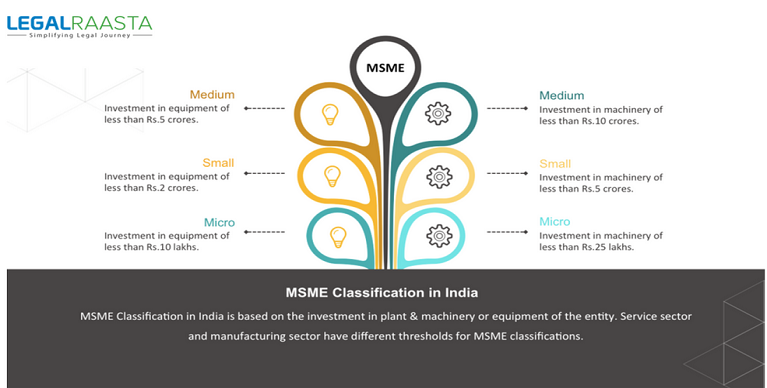 MSME means micro small and medium enterprises. These units serve as the backbone of our country which helps our country to develop economically as well as financially. For supporting these MSME the government of India has started various measures and schemes and one of them is micro, small and medium enterprises act. To avail the benefits provided by the government every MSME registration, though the registration is not mandatory. It is beneficial for these enterprises to avail certain exemptions, a lower rate of interest, tax subsidies and power subsidies. In the manufacturing sector, a micro enterprise is that enterprise which has an investment of Rs 25 lakhs or less in plant and machinery. In the service sector, a Micro Enterprise is that enterprise which has an investment of Rs 10 lakh or less in plant and machinery. In the manufacturing sector, a Small Enterprise is that enterprise which has an investment of more than Rs 25 lakhs but less than Rs 5 crores in plant and machinery. In the service sector, A Small Enterprise is that enterprise which has an investment of Rs 10 lakhs or more but less than Rs 2 crores in plant and machinery. In the manufacturing sector, Medium Enterprise is an enterprise which has an investment of more than Rs 5 crores but less than 10 crores in plant and machinery. A Medium Enterprise is an enterprise which has an investment of more than Rs 2 crores but less than Rs 5 crores in plant and machinery in case of the service sector. You need to get a provisional certificate after starting with a micro, small or medium enterprise. The provisional certificate received by the enterprise is for the period of 5 years. After receiving this provisional certificate you can opt for a permanent certificate which is valid for lifetime. If you want MSME registration for your enterprise then you have to submit proof of address of the business, proof of identity of all the promoters and constitution of the company, partnership deed and incorporation certificate. The time required for MSME certificate- the micro, small and medium enterprises certificate is state specific. It takes about 10 to 15 working days to obtain the certificate. The process is not very lengthy and complicated. LegalRaasta is an online portal which can help you with the MSME Registration within a specific period of time.